For EEG and TMS research we use Nexstim Ltd systems (manufactured in Finland). 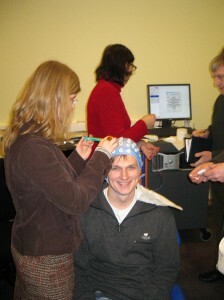 We use 64-electrode caps for EEG, including special electrodes immune to the possible adverse effects of TMS. Navigation of TMS locations is aided by the MRI based visualization system that can be used online with experiment in real time. 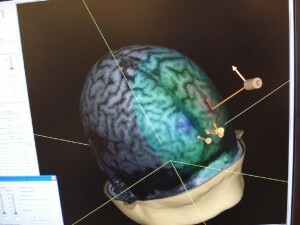 TMS target locations are indicated on individual brain MRI images, which can be peeled to different depths. Momentary locations of TMS focus are displayed on-line. Mapping and navigation is aided by infrared stereo-camera which allows to get 3D information from the special reflectors mounted on subjects’ head and TMS coil. Before experiment, individual dimensions and reference point locations of that particular subject’s head-brain are entered to the system by the pencil with similar reflectors as used on TMS coil and subject’s spectacles.